Luck. An ephemeral notion that some believe governs our lives, and that everyone is imbued with a certain amount of it, whilst others create their own. But what if it could be made tangible and transferable? What if people could trade luck, or bet for it? That is the central idea behind Intacto, the debut feature by Spanish director Juan Carlos Fresnadillo. In this world, people can steal the luck of other people by touching them, taking a photo of someone captures their luck and makes it transferable, and a secret organisation of thrill seekers and gambling enthusiasts engage in games of chance in order to acquire more luck for themselves. Such a outlandish central concept might be difficult to take, were it not for the skillful way in which Fresnadillo introduces us to his ideas, establishing very early on how serious luck is to his characters, and the lengths they will go in order to obtain it. Federico (Eusebio Poncela) works for The Jew (Max von Sydow), who lives in a casino and reigns as one of the chief collectors of luck in the world. Federico finds challengers for him so that he can test his luck in the most dangerous means possible. Years of this has begun to weigh on Federico's conscience and he wants out, but The Jew won't let him leave without first stealing his luck and leaving him beaten and broken at the side of a road. Years pass, and Federico has spent his time trying to find someone to finally take down his former employer. He uses his connections with an insurance agency to find survivors of terrible accidents and trains them in how to use their luck. After one such trainee is killed in a car accident, Federico finds himself despondent and at a loose end, until Tomas (Leonardo Sbaraglia), the lone survivor of a plane crash falls into his lap. Unfortunately, Tomas is a wanted criminal, and the two have to go on the run, pursued by Sara (Mónica López), a cop with a tragic past, and they have to work to acquire enough luck to finally take down The Jew. As we see, from very early on the film ensures that we are aware of the consequences of winning and losing luck. The violence meted out to Federico, the death of his protégé, and the mere fact that Tomas survives when hundreds of others around him perish, tell us that luck is a serious business. This gives Fresnadillo and his co-writer, Andrés M. Koppel , license to slowly increase the stakes of the competitions as we become more engrossed in Federico and Tomas' journey for revenge. They start off small, with contestants smearing their heads with molasses and seeing which of them an insect will land on, and gradually builds and builds until we are watching people running blindfolded through a forest. Intacto is a difficult film to pin down. It refuses to stick to any single genre, encompassing aspects of several without wholly embracing any of them. The very idea of the film has shades of science fiction to it, yet the film utilises a fervently realist approach to its visual style that, whilst doesn't necessarily contradict the fantastical idea, goes a long way to establish its believability. There are also definite thriller elements to it, with Federico and Tomas' cross-country escape from the law making for moments of tension, yet we never feel as if that is the main thrust of the film, serving primarily to establish the relationships between the characters (they also make for one of the most visually striking images of the film; as Tomas lies sleeping by a pool, we see hints of red and blue light playing over the surface, announcing the arrival of the police in a subtle, lyrical moment). Finally, the story seems to be a standard hero's journey, with a definite beginning end, a protagonist and an antagonist, yet the film doesn't seem to side with anyone. No one is wholly good, all have definite darkness and cruelty in their past, and no one is wholly bad, even von Sydow gets to deliver a moving speech detailing why he does what he does. 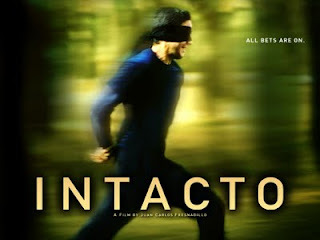 Intacto is an intelligent film that takes an obtuse idea that could easily have been ludicrous or incomprehensible and makes it both practical and exciting. At a time when people are crying out for science fiction films that are driven by ideas and delivered with crowd pleasing aplomb, you owe it to yourself to discover this lost curiosity.